Action from Holbeach (stripes) v AFC Kempston in the United Counties Premier Division. Photo: Tim Wilson. A blistering start to the game at Carter’s Park saw the Tigers roar into a 3-0 lead in just 14 minutes against unbeaten leaders AFC Kempston. AFC Kempston equalise from the penalty spot at Holbeach. Photo: Tim Wilson. Goals from young Sean Couglan (2 mins), Jordan Thomas (10 mins) and Stacy Cartwright (14 mins) looked like inflicting a first defeat in 27 league games this season on the visitors, as well as putting the home side firmly back in the title race. But long, unbeaten runs don’t arrive by chance and Kempston hit back with three second-half goals to force a 3-3 draw. Two were scored from the penalty spot, with the second one, an equaliser 20 minutes from time, hotly contested by the home side. Kempston were knocked off the top on goal difference though. 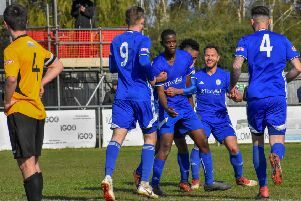 Leicester Nirvana are back on the summit after a crushing 8-1 win at rock bottom Huntingdon for whom substitute Jordan Brockett claimed a late consolation goal. Fifth-placed Holbeach have games in hand on the top two, but they are 13 points adrift. Fourth-placed Deeping Rangers were beaten by a solitary first-half goal at home to Kirby Muxloe, while Yaxley went down 2-1 at third-placed Newport Pagnell. Substitute Dan Cotton shot Yaxley level midway through the second-half, but the hosts hit the front a few minutes later and stayed there. Hayden Bream (stripes) in action for Peterborough Northern Star at Oadby. Photo: Tim Gates. Peterborough Northern Star will be seeking a new manager at the end of the season after Seb Hayes announced his intention to step down in the summer for personal reasons. Hayes has done well with limited resources this season, but Star are 10 games without a win after a 2-2 draw at lowly Oadby yesterday. Danny Barker fired Star ahead, but it required an equaliser six minutes from time from Hayden Bream to earn the city side a point. Wisbech were denied victory at Desborough by a last-minute leveller. Danny Beaumont had earlier scored his first goal for The Fenmen since returning to the club. In Division One the Peterborough Sports juggernaut was back up and running. After 21 straight wins, Sports lost two away games on the bounce, but they protected their 100 per cent home winning record with a 3-0 success over Rushden & Higham. Goals from Karl Gibbs, Avelino Vieira and Josh Sanders were enough for the city side to extend their lead at the top to 13 points. Blackstones extended their unbeaten run to six matches after scraping a 1-0 win over bottom club Burton Park Wanderers. Callum Parker claimed the vital goal 11 minutes from time. Bourne are up to fifth after beating Irchester 4-2 at the Abbey Lawns. Zak Munton, Jack Humphries, Aaron Jesson and Dan Schiavi scored the Bourne goals. It was a bad day for local Evo Stik League sides as struggling Stamford AFC were predictably beaten 2-0 at promotion-chasing Workington in the Northern Premier Division, while a first defeat in five Division One South matches sent Spalding United spinning out of the play-off places. Stamford remain five points from safety, while Spalding are down to seventh after failing to hang on to a first-half lead given to them by in-form Tom Waumsley at Coalville. The home side scored twice in the following 10 minutes on the way to a 2-1 win. A miserable first-half performance cost March Town United at Woodbridge in Division One of the Thurlow Nunn League. The home side were 3-0 ahead at the break and, although March replied after the break with goals from Kieran Evans and Matthew Barber, it was too little too late.